Swan's place: Burns, baby, Burns! It was quite the international environment, last weekend. At our table alone we counted at least 9 languages spoken fluently amongst 5 or 6 nationalities with a background of many cultures. 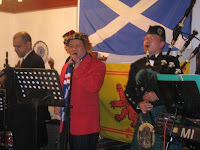 All this at a Scottish party - in a Portugese Pousada - in Macau - which is China. As our host the Scotsman explained:" Robert Burns was a womanizer, a sexist, a racist, and a briljant poet. He died young, and his friends started to honour him with lunches where the ate, drank, sang and read his poetry. This became a tradition and the aniversary of his birth (1759) is now celebrated by Scots all over the world. Ah, Scots take any excuse to eat, drink and celebrate..."
So we were invited by our Scottish-Dutch friends in Macau to celebrate Burns Night. Jaap in dark suit, a new shirt and bowtie and me in a cocktaildress. Not just the clothing was official, the program of the night was as well, with our hosts being the Chieftain and Chieftains wife this year, which is some sort of mix between host and guest of honour, and it means he got to bless the meal, and his knife (called a 'Dirk' as well) was used to stab the haggis. (don't ask - another tradition! )There was traditional Scottish food (as mentioned: haggis), and there were speakers: one man recited a Burns poem, by heart! which lasted for 10 minutes - the ladies were greeted, the guests were toasted, the men were thoroughly mocked and greeted - speeches full of wordplay and wit. there was dancing, there was singing, there was booz. AND I got to the bottom (no pun intended!) 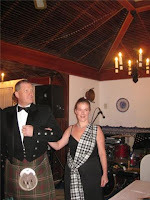 of the kilt -secret....But I promised not to publish!! Ahyah...you can not show us the most exciting picture of the night! Is it true? Glad you had fun. Did you eat neeps and tatties with your haggies? YUM! And yes, we did have neeps and tatties with the haggis, that made it easier to eat :-). Though it was not too bad, I have to admit. Won't order it by myself though! I love haggis. Must be one of those childhood things... if you don't grow up eating it you don't enjoy it so much.